1) The entire region of New England is now smoke-free. On June 19, New Hampshire Governor John Lynch signed a bill that will force a smoking ban upon all businesses, bars, and restaurants in the “Live Free or Die” state starting September 17. 2) Maduro fans will be delighted to hear that a maduro version of the Perdomo Lot 23 is now available. Ranging in four sizes from Robusto to Churchill, they run from $4.25 to $5 apiece. 3) Wayne Burkholder has experienced the same problem most golfers have: no place to leave a cigar while swinging. To solve this age-old quandary, Burkholder came up with what seems to be the best solution yet. 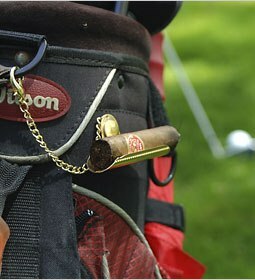 He invented a cigar holder that attaches to those normally unused snaps near the top of your golf bag. 4) Around the Blogs: Stogie Review fires up a Henry Clay. Cigar Jack tries a Bolivar Coronas Gigantes. Keepers of the Flame reviews the Partagas Black. The Smoking Lounge has a Monte No. 4. Velvet Cigar smokes an Oliva Series S. Matt reviews a Tatuaje RC184. 5) Deal of the Week: Tinderbox.com has come through and is once again home to the week’s best cigar deal. This time it’s their Premium Sampler which features 9 “high end” cigars for $49.95. If bought in a B&M, the price would be almost double. The sticks include Cohiba, Ashton, Don Pepin Garcia Black, 601, Montecristo Classic, and four other top notch smokes. Grab yours here. I wish you guys would make up your mind. One day there is absolutely no need for a gadget to hold your cigar on the course, then today it's an "age-old quadary" to which you have found the "best solution yet." In all honesty, I was never a fan of just leaving my stogie in the grass, I just fel the need to be a bit a smarta** just now for some reason. You make a good point. Truth be told, we were about to preface #3 with a clause like, “We’ve pointed out the needlessness of cigar gadgets in the past, but…” We decided against that for brevity’s sake. Our motive for speaking favorably of this “gadget” (if you can call it that) is this: While most expensive accessories are a complete waste of money, this simple device truly seems like a great idea. Every once in awhile, some new cigar-related thingamajig comes along that makes sense and actually solves a real problem. This seems to be one of them.